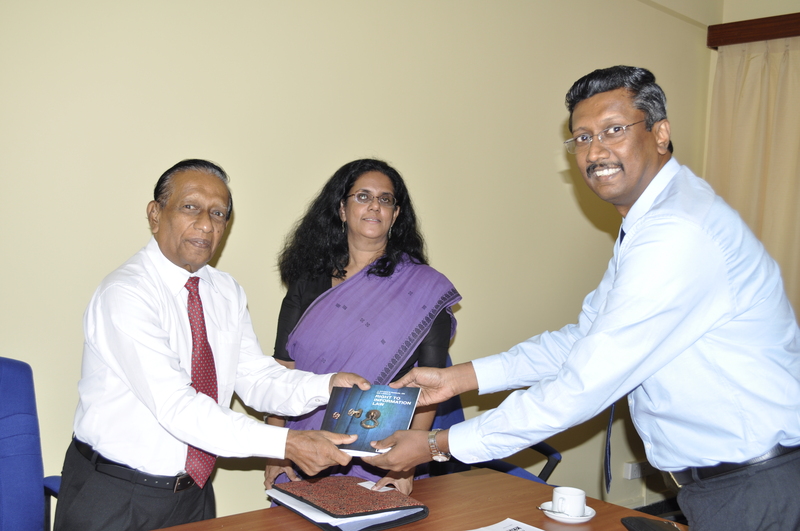 The Right to Information Commission Chairman Mr. Mahinda Gammanpila (2nd from Left) being presented with copies of “A Citizen’s Manual on Sri Lanka’s Right To Information Law” by the Sri Lanka Press Institute CEO, Kumar Lopez (extreme Right). Also in the picture is RTI Commissioner Ms. Kishali Pinto-Jayawardena. The Right to Information Commission Chairman Mr. Mahinda Gammanpila (2nd from Left) being presented with copies of “A Citizen’s Manual on Sri Lanka’s Right To Information Law” by the Sri Lanka Press Institute CEO, Kumar Lopez (extreme Right). Also in the picture are the other members of the Commission, Ms. Kishali Pinto-Jayawardena (second from right) and Mr. S.G. Punchihewa (extreme Left). ← The International Day to End Impunity for Crimes against Journalists.